Read to know how ERPNext integrates with multiple popular third-party services effortlessly to help you boost your business. ﻿You go to an e-commerce site, add items to the cart, checkout, make payment and boom! Sounds simple and linear. Right? But not so linear in the backend. You just employed four different applications, integrated with each other, which lead to successful placement of your order. The items listing and order placement was handled by an e-commerce platform. Payment was handled by Payment Gateway. They sent a confirmation back to e-commerce, so that order could be confirmed. Your order was synced into seller’s ERP system so that they could implement logistics and fulfilment. And that’s how you eventually get an item delivered to your doorsteps. You do need an ERP software that can connect with multiple external services to smoothen your business process. After all, the point of the ERP system in the first place was to help you handle your business with ease. Luckily, if you’re using ERPNext (or giving it a thought), we’ve got you fairly covered. We will have a look at all the different services you can connect to using ERPNext and how it helps you have a better control over your overall business. ERPNext has a host of connectors readily available help you take-off faster. Following is the brief on some of the connectors which are favourite and demand by many ERPNext users. “Hey, I would like to get paid for what I do”, said Sonal Ramnathkar, an ERPNext User in her conference talk. Getting paid an important business part, and it’s made easy in ERPNext with multiple payment gateway integrations available out of the box. It is common for businesses to use payment gateways to receive payments from customers all across the globe. A digital payment gateway gives one the flexibility to receive payments from anyone, at any time, anywhere easily. The most well known online payment and money transfer service seamlessly integrates with your ERPNext instance. Just go to Integrations in your ERPNext account and enter the required credentials. Once this is done, you can generate payment requests with your PayPal payment link from within the app! When your PayPal account is linked, an account head is created in the Chart of Accounts too which is updated via Journal Entry when payments are made. Stripe is one of the more recent integrations into ERPNext. The fairly new payment gateway has gained popularity over the years. Its flexible structure allows one to create subscriptions, an on-demand marketplace, an e-commerce store, or a crowdfunding platform. Just like Paypal, integrating Stripe with ERPNext is a cakewalk. Just simply add the Public and Private keys into your ERPNext account and violà! An account head is also created in your Chart of Accounts and you can generate payment requests with it. Razorpay is an online payment solution for merchants in India. It is a good local alternative for Indians against global giants like PayPal or Stripe. Setting up Razorpay integration is as easy as the other gateways mentioned above and the functionality is fairly similar. Braintree is another payment gateway which offers flexible web and mobile payment solutions to merchants backed by PayPal. To setup Braintree in your ERPNext account, you simply need to enter three parameters: Merchant ID, Public Key, and Private Key. GoCardless integration is another feature contributed by our ever growing community. GoCardless is a UK-based Direct Debit provider which allows companies within the SEPA zone to collect wire transfers easily without having to process it manually with the bank or through a protocol like EBICS. Note that both Braintree and GoCardless will be available from version 11. Now that we're done with payments, let's move to e-commerce. ERPNext has a website + e-commerce functionality available inbuilt. Do give it a try ?. But if you are already hooked to Shopify or WooCommerce, we have connectors readily available for them. Shopify is one of the widely used e-commerce platforms by business who sell online. The platform boasts of a user base consisting of more 600,000 merchants currently. With Shopify, you can get your website up and running within no time and start connecting with your customers. ERPNext has connector readily available for Shopify when you receive an order on Shopify, it will be synched with your ERPNext account as a Sales Order. If payment is received, it will also create a Sales Invoice and Payment Entry against that Sales Order. The only part remaining is Delivery Note, which you can create when actual fulfilment is completed. Go here to see how you can install the connector. PS: The integration is currently being refactored and will be available in the coming months. Then you don’t need to install the application separately and will be available in-app! The connector creates a Sales Order in your ERPNext account when an order is submitted on WooCommerce. What's so unique about it? The power of community! 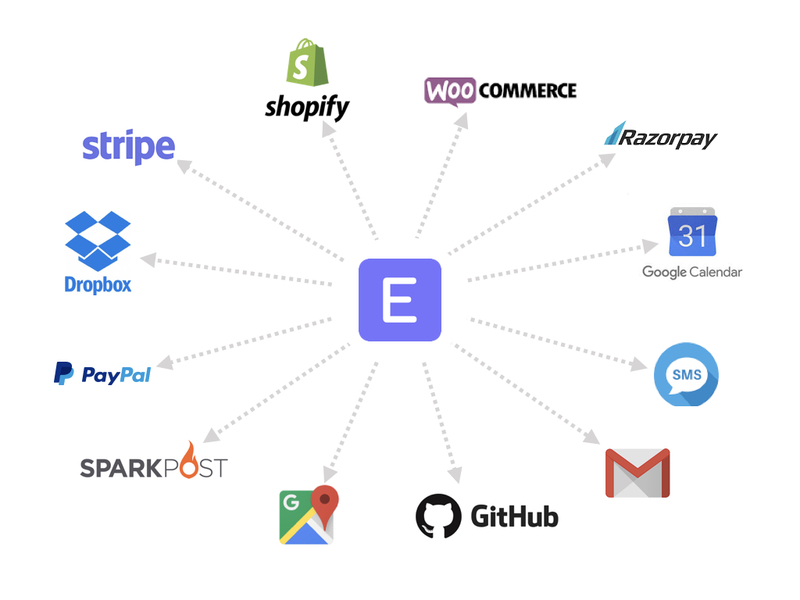 The WooCommerce connector was contributed in ERPNext by one of the ERPNext Service Providers. Read the full story here. Communication is a very important aspect of business and core of how you get things right. ERPNext helps you sync all your business communication in one place which thereby helps you take a better control and decision for your business. Here is what we get in Emails for you. We are sure you have an account on of these! ERPNext has an Email Account feature, functions just like your local email client setup. Provide your incoming and outgoing email gateway, and it will start syncing your emails with Communications master of ERPNext. It doesn't stop here. You can also reply to the customer's email right from your ERPNext account. And when your contact replies to you, it's again synced. So track all your communication in one place and convert them into business right from your ERPNext account. You can also configure custom domains in the same way. Just simply configure the SMTP/IMAP ports as detailed in the manual. Another contribution from the community! This recently merged feature allows your ERPNext events to sync with your Google Calendar. Not an email person? Don’t worry. ERPNext also integrates with SMS gateway providers who provide HTTP API so you can configure and send SMS alerts to your users. All you need to do is obtain certain static parameters for your SMS providers like the username, password, etc. Once configured, go to the SMS centre and send your messages right away. LDAP stands for Lightweight Directory Access Protocol is a client/server protocol used to access and manage directory information over an IP network. The usage of LDAP is similar to that a library card or telephone directory where the data is written once but has to be queried multiple times as the protocol delivers faster performance for these scenarios. To enable LDAP Login in ERPNext, you just need to enter a few details into the Settings such as LDAP Server Url, Organizational Unit, UID, Base Distinguished Name (DN) and Password for Base DN. Once configured, the users can use their LDAP credentials to log in to their ERPNext account. Despite all of its cons, social media isn't going away anytime soon for now. Logging in with social media accounts is a very popular feature which spares users from creating additional accounts and remembering more passwords. In ERPNext, you can enable social logins for Facebook, Google, GitHub, and Frappe! To know how to configure these, simply check out our manual. Having access to your data anywhere on the go is really important. ERPNext connects to both Dropbox and Amazon S3 so that you can directly upload your ERPNext backups to these platforms. To enable direct upload of backups, just enter your credentials and set the frequency of uploads. Rad the detailed documentation to do so here. Anything Missing You Need? It's doable with our Rest API/Data Migration Tool! ERPNext has all the touch-points you need to develop and contribute need connector for your preferred application. You can use Data Migration Tool of Frappe Framework, available in-built, to make endless integrations! Check the following video to see the Data Migration Tool in action.